The new cardinalfish Ostorhinchus yamato sp. nov. is described on the basis of 135 specimens collected from Japan. The new species resembles Ostorhinchus gularis (Fraser and Lachner 1984) and Ostorhinchus atrogaster (Smith and Radcliffe in Radcliffe 1912) in body coloration, lacking distinct stripes on the lateral surface and a distinct blotch on the caudal-fin base, but differs in having 24–28 (modally 26) developed gill rakers, 25–31 (modally 28) total gill rakers (including rudiments), the body depth 21.9–28.4% of SL (mean 24.1%) and upper-jaw length 12.3–15.5% (13.5%). Apogon smithvanizi Allen and Randall 1994 is reconfirmed as a junior synonym of O. gularis. Although the new species is superficially similar to a co-occurring species Rhabdamia gracilis (Bleeker 1856) in overall body appearance, numerous differences exist between the two species. This article was registered in the Official Register of Zoological Nomenclature (ZooBank) as 886C86AE-692A-4448-A2BA-5C7D0281F28B. We are very grateful to M. McGrouther, A. Hay and S. Reader (AMS), M. Sabaj (ANSP), O. Crimmen and J. Maclaine (BMNH), A. Suzumoto (BPBM), H. Endo (BSKU), T. Nakabo (FAKU), G. Shinohara and M. Nakae (NSMT), R. Bills and O. Gon (SAIAB), J. Williams (USNM), S. Morrison, G. Moore and M. Allen (WAM), and K. Hagiwara (YCM) for opportunities to examine specimens of Ostorhinchus, and staff of Kaiei Fishery Cooperative Society, Japan, M. Itou (KAUM), M. Yamada (Kagoshima City Aquarium, Japan), H. Endo (BSKU), N. Nakayama (Tokai University, Japan), N. Okuda (Research Institute for Humanity and Nature, Japan), Y. Kobayashi (Tokyo, Japan), K. Koeda (National Museum of Marine Biology & Aquarium, Taiwan) and G. Ogihara (Yokosuka, Japan) for collecting specimens. We also thank Y. Haraguchi and other volunteers, and students of KAUM for their assistance, and G. Hardy (Ngunguru, New Zealand) for reading the manuscript and providing help with English. 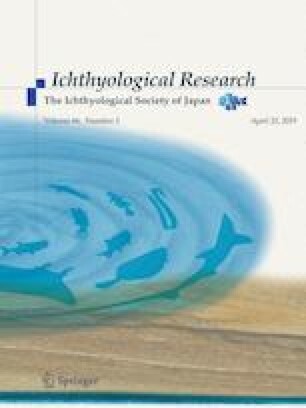 This study was supported in part by the Sasakawa Scientific Research Grant from the Japan Science Society (29-747), Grants-in-Aid for Scientific, JSPS KAKENHI Grant Numbers JP26241027, JP24370041, JP23580259, and JP26450265; the JSPS Core-to-Core Program: B Asia-Africa Science Platforms; the “Biological Properties of Biodiversity Hotspots in Japan” project of the National Museum of Nature and Science, Tsukuba, Japan; “Establishment of Research and Education Network on Biodiversity and Its Conservation in the Satsunan Islands” project of Kagoshima University adopted by the Ministry of Education, Culture, Sports, Science and Technology, Japan; and the “Island Research” project of Kagoshima University.